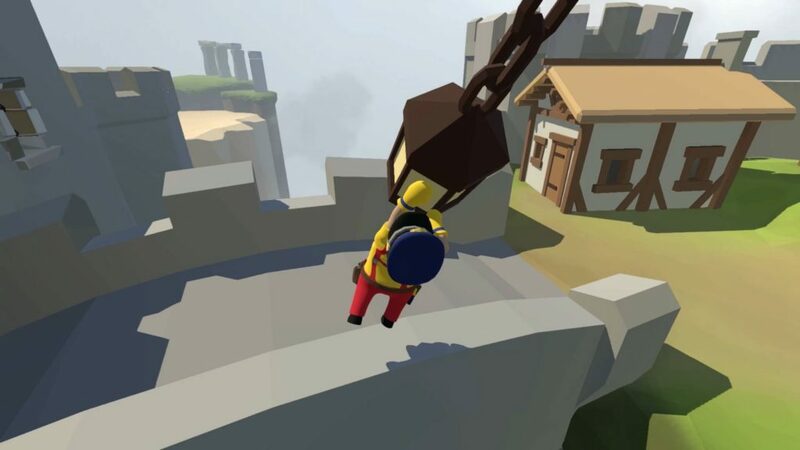 Human Fall Flat Review – Falling flat on your face! 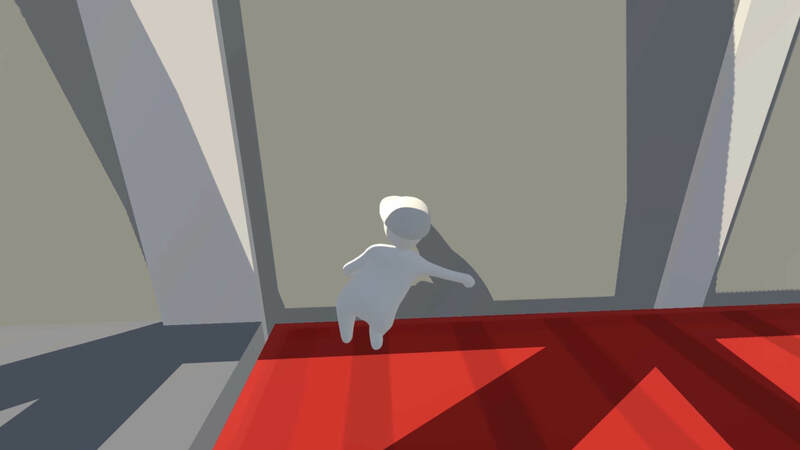 Human Fall Flat is a game that is literally about falling flat on your face. 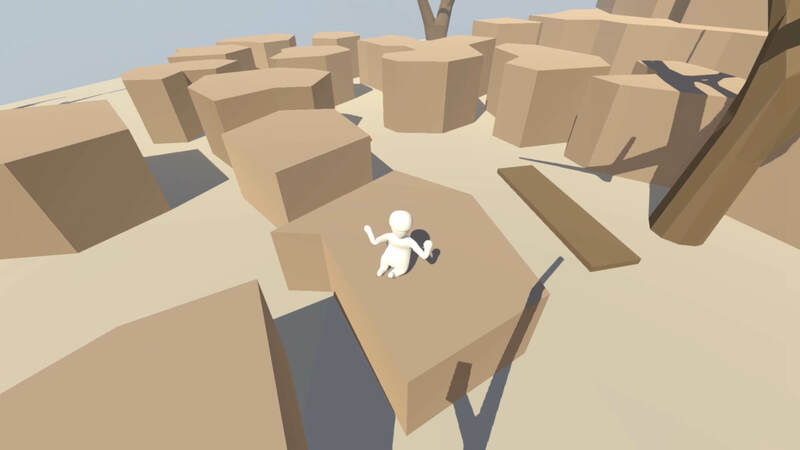 In other words, it is a physics-based puzzle game that has a, for gaming, rather unusual way to traverse its environments. To kick things off, let’s take a look at the graphics and atmosphere. The game has a very cartoony artstyle that allows all objects in the game to remain quite clear and simple. Shadows are however applied in such a way that they make the game look detailed regardless. For a puzzle game, this is a good call as the necessary objects to clear the puzzles will always remain reasonably obvious, meaning you should never have to hunt the map for the missing invisible puzzle pieces. The game features a little bit of narration, which makes it somewhat reminiscent of a fairy tale. The ability to customize the character also fleshes out the game a little bit. With the addition of the ambient soundtrack, the game sets a very relaxing tone. While a more upbeat soundtrack would have been preferrable, the soundtrack still serves its purpose. This brings us into the question of the performance of the game. Straight up, the target performance level on the Nintendo Switch is 720p undocked and 1080p docked, both at 30 frames per second. For a game that looks like this, the target seems a bit low. Further, the game seems to be unable to hold the 30 frames per second in either configuration. It seems that there is stuttering by the means of uneven frame pacing, making the game less enjoyable to play than it could be. The reason the game could have opted for 30 frames per second rather than 60, is because there are actually quite a few physics simulations contained within it, which is a major stress on the processor. What’s more, the features of the Nintendo Switch version have been neglected. The game lacks any noticeable rumble features. However, it supports splitscreen play, even though the game normally requires both thumbsticks to work. The game opted to use motion controls for camera controls in this case, which is in our opinion a great option giving the players more options. This alone ups the value of a game by a decent amount. Yet another thing we’ve noticed is that some elements in the game do absolutely nothing as they are designed with a system that supports achievements in mind. Here is an example; in one of the earlier levels there is a cave with 5 glowing cubes inside. Putting them together in one place gave you an achievement on other platforms, but on the Switch they do absolutely nothing. This is of course strange as putting in secrets that result in nothing could make players feel like they’ve wasted their time. A personal nitpick of ours, touchscreen support in menues when playing the game would have been nice. Alltogether, we are unable to call it a bad port because that would do it injustice, but it’s far from being a good one either. The port ends up being short on our expectations and therefore finds itself falling flat on its face. 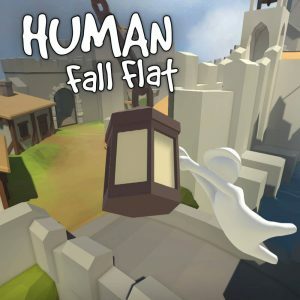 What we’ve noticed right away when playing Human Fall Flat, is that it has its own set of rules and mechanics. The game tries to create more “realistic” physics for the way you move your character. This means that things that are easy in other games end up being a puzzle in this one. The game therefore defines a great set of unique rules and boundaries, with which we hopefully get unique, interesting and engaging gameplay. Now to the mechanics, the game is played by simply being able to move around and also grab and hold onto things with your hands. Both hands are mapped indepently to the appropriate shoulder button. With them, you are able to press buttons, carry things and even lift yourself up. Basically, with the left thumbstick you control your movement with the legs and with the right one the direction of your hands. This is pretty simple, but as you unravel the game you will find an insane amount of uses with just these plain inputs, which is actually pretty awesome. While at the start you will just be pressing some buttons and carrying stuff, you will soon learn to pull yourself up to ledges and then to swing yourself on poles and so forth. There is some creative use of the controls throughout the game which keeps it from ever becoming stale. This is a sign of a very well thought-out game from talented developers. Another huge plus point to the game is that it teaches you its mechanics very well, without ever giving away the direct solution to a puzzle. Take a look at this example. In one puzzle, you need to push a train wagon away with your hands while standing on top of another. While doing so, you should notice that the wagon you stood on actually moved as well and this is the exact cue necessary to solve the very next puzzle. That one requires you to move something with your feet and if the just mentioned first puzzle was missing, you would probably be wondering on what to do for a very long time. As you’ve been given the cue by just solving the previous puzzle, it should only take you a couple of moments to figure out the solution. This makes for a really good puzzle experience. The only thing to really critize the gameplay here for is that it is slow by nature. Since the challenge of the game is the movement and the controls themselves, traversal is a lot slower than in other games making this one feel quite slow and sluggish. It was also quite annoying in some puzzles, were some sort of fine-tuned precision between multiple objects is necessary. This can also take quite some time and is especially annoying, when you have actually already solved the puzzle in your head. 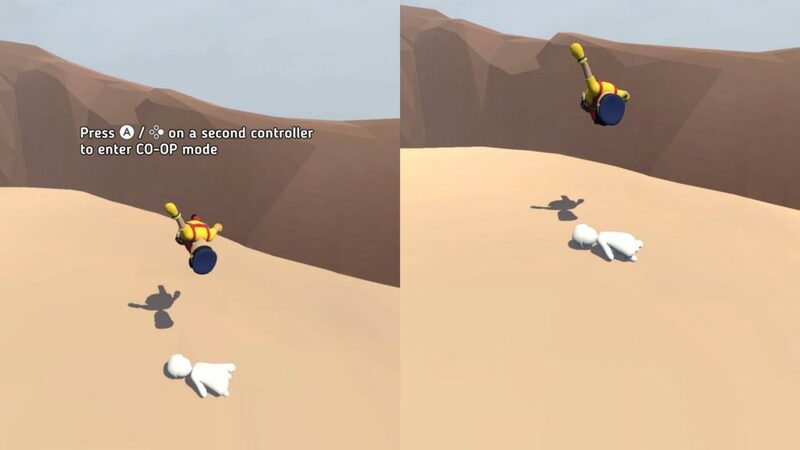 To remedy these things, ways to accelerate your character by skillful use of the controls could have been implemented here. With the seeming slowness of the game, it can therefore be recommendable to play this game only for multiple and shorter play sessions. Since most people look at the price of the game as well as at review scores when buying a game, we decided to give games both a score and a recommended purchase price here at Red Value Gaming. We call this recommended price the value of the game and it, in a way, becomes a second review score. We can definitely see that the game has a lot of unique elements that are fun and engaging to do with only the sluggishness of the game slowing it down. Therefore, we estimate the game’s score to be around 80/100. For the value, taking a look at howlongtobeat.com, the game takes most players around 5 hours to beat on its main playthrough. Along with the port that could be described as acceptable but still leaving things to be desired, we are unable to recommend this game at its full price on the Nintendo Switch. We therefore estimate the value to be around $10. 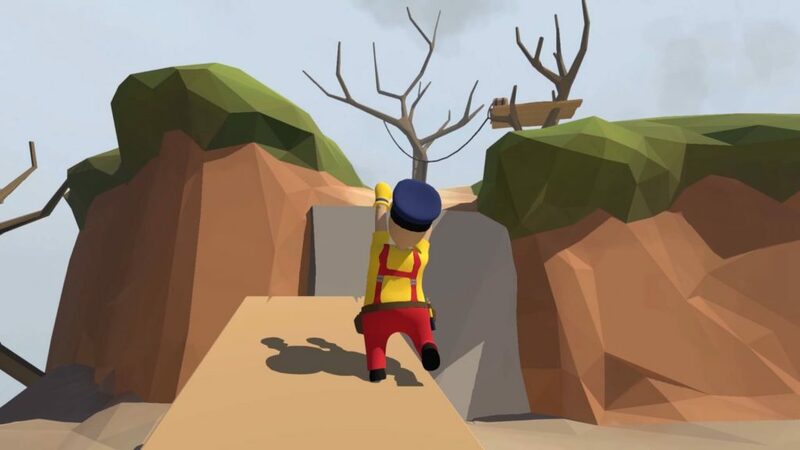 The port of Human Fall Flat to the Nintendo Switch is ok but far from great. The game is definitely a worthwhile play if you like phyics-based puzzles, but maybe pick it up on a light discount.